Creatine, a nonessential molecule that occurs naturally in the body, is known widely for its use as a sports supplement, particularly by bodybuilders and competitive athletes. While creatine supplements may be able to increase muscle mass and improve athletic performance, there are also potential risks associated with the performance-boosting supplement. High doses of creatine can cause a number of common side effects and may pose a risk to the kidneys. Neither the NCAA nor the International Olympic Committee classifies creatine as a banned substance. If creatine were a high-risk substance known to cause health problems, it would not be allowed by these organizations. 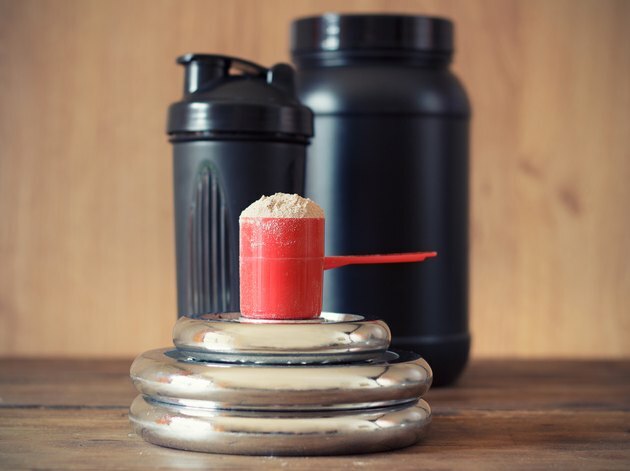 According to University of Maryland Medical Center, creatine supplements are generally safe, but they can pose a risk when consumed in excessive doses. In addition, the body may stop producing its own creatine as a way to regain homeostasis when high amounts of supplemental creatine are taken regularly. The University of Maryland Medical Center reports that serious potential side effects, most notably kidney damage, may be associated with high doses of creatine. A report published on the U.S. Food and Drug Administration website confirms this. It states that most of the accusations against creatine, with regard to its health effects, concern renal or kidney function. The FDA report includes a case in which creatine supplementation was linked to an athlete who died of renal disease. The report also describes another patient with renal disease, who was taking creatine but saw health problems recede after no longer taking creatine. The report notes, however, that extensive research on the effects of creatine on renal function has shown no adverse reactions. The more common side effects that can occur with creatine use are also related to higher doses. According to Dr. Ray Sahelian, nausea, loose stools, cramping, upset stomach, weight gain, diarrhea and weakness usually occur when more than 5 grams of creatine are used per day. The University of Maryland Medical Center notes that side effects of creatine can also include dizziness, high blood pressure, liver dysfunction and kidney damage. Most research has found that creatine causes no major side effects when used for as long as six months at a time. To avoid the potential serious and more common side effects associated with creatine use, be sure to stay within the recommended daily dosage. A maximum of 5 grams of creatine per day should be used, although the University of Maryland Medical Center notes that a "loading phase," in which four doses of 5 grams per day (totaling 20 grams) can be used for two to five days. If you choose this method, a subsequent "maintenance" dose of 2 grams per day should follow. Creatine supplements should not be used by children or teens or those with kidney problems. Before starting creatine, be sure to see your doctor to determine if you are healthy enough to use creatine.